Use these tips to get the results you want on the big day. 1. Get all your race gear ready. Start from your feet and work your way up – shoes, socks, shorts, t-shirt, time-chip, race number, safety pins, sunscreen, etc. 2. Plan your trip to the race venue. Generally it will be busy with limited parking, so think about the best method – public transport or driving and parking a little further away and warming up with a brisk walk or light jog in. 3. Be prepared for breakfast. Make sure all your breakfast items are ready – there’s nothing worse than having no milk or bananas the morning of the race! 4. Know the running course. Ideally you will have run part or all of the course in the lead up to the race, but if not be sure to look up the course online so you get a feel for what’s ahead. 5. If you can, pre-register That means you have one less thing you need to do on race morning. 6. Ease into the morning. Enjoy your breakfast and try to relax before the race. 7. Don’t get overawed. There is lots happening on race morning with hundreds of people all around – try to stick to your normal routine. 8. Allow plenty of time for toilet stops. Whether it’s nerves or extra hydration, everyone seems to need the bathroom more on race morning! Try to avoid having to wait in long queues by keeping your normal routine or else allow plenty of time. 9. Keep warm. It can get cold pre-race. There is usually a wait before you set off and with everyone hanging around it gets a little chilly. Many runners wear an old top they are happy to dump at the start line, while others check in a bag as late as possible or have family and friends nearby to take their outerwear before they start. 10. Find a position. The start line can get crowded with people jostling for position. Try not to get caught up in this – find a spot and get started in your own way. 11. Start steady. The first kilometre is packed with everyone finding their form and getting into the race. You can either focus on getting ahead of the pack (but be sure you have included this type of start in your training, or you will ruin your rhythm and be puffing in no time), or you can stay on the edges and avoid the main thoroughfare of traffic, or you can just work your way through the people, moving around people slower than you and allowing people faster than you an easy passage through. 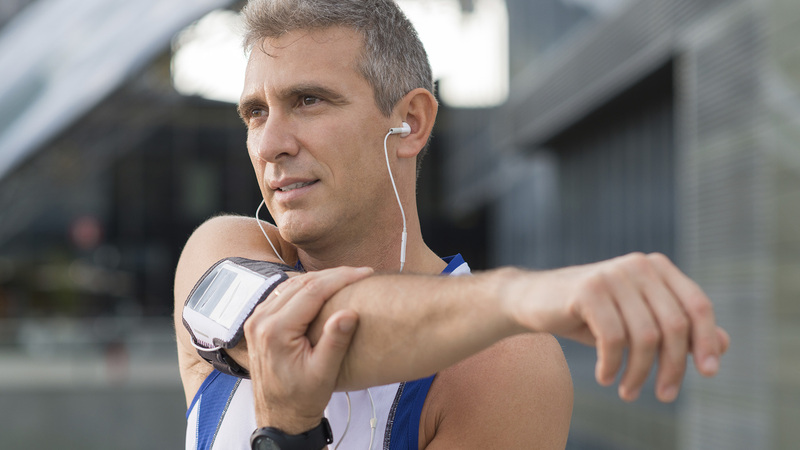 After five minutes or so you should be able to get into your regular running rhythm. 12. Break it down. No matter the distance, break it down into smaller races – a good tip is to think about the first 2-3 km and get into a nice comfortable pace. From there, break the race down further into sections and just tick them off. Use drink stations as mini-races. 13. Use other runners as targets. As you run along, a way to keep pushing and to keep focused is to target people and try and push towards them or keep up with them. 14. Watch the pace runner. If you have a finish time in mind, keep an eye out for the pace runner. Most larger races have pace runners who often carry a balloon or wear a distinctive outfit – so if you want to run a 3:30 marathon, find the 3:30 pace runner and follow them to glory! 15. Drink smart. Do not make race day the first time you have tried to run while drinking out of a plastic cup – it’s harder than it looks! There is nothing wrong with slowing down, even to a walk, so that you can get the fluids in at drink stations and get going again. You won’t lose that much time and getting fluid in is very important. 16. Keep fuelled up. Depending upon your distance be aware of how much fluid and carbohydrates you will need during the event and make sure you have a race plan and stick to it. For example, you might decide every 5 km you will get in 100 ml of fluid and every 15 km you will get a carbohydrate gel in. 17. Aim for a negative split . A great way to run your race and come home strong is aim to run the second half quicker than the first. 18. Enjoy the crowds. It can be a great atmosphere with people watching and cheering runners on. Enjoy the feeling and use their cheers as motivation. 19. Finish on a high. Soak up the last hundred metres to the finish line. You have trained hard for this – enjoy that moment as you cross the line. 20. Stick around. Don’t leave straight away – running events are great for the community so take a moment to relish in the post-race buzz.